Cross-country skiers from Idaho, Wyoming, Utah and Montana joined the fun Saturday and Sunday at Ketchum’s Lake Creek trail system for the 2012-13 Intermountain (IMD) Series season race debut. A total 135 skiers including nearly 60 from Sun Valley took part in Sunday’s mass-start classic races, one day after the freestyle prologue races got everyone’s ski legs up and running on the Lake Creek course. 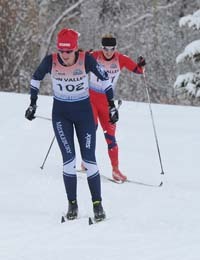 Sun Valley Ski Education Foundation Gold Team racers Mikey Sinnott (31:30) and Patrick Johnson (31:34) led the men’s 10k classic racers. Former SVSEF race star and Community School graduate Annie Pokorny of Middlebury College (18:40) won women’s 5k. Dec. 22-23, 2012, Intermountain Division (IMD) Series cross-country races at the Lake Creek cross-country trails 3 miles north of Ketchum—staged by the Sun Valley Ski Education Foundation cross-country team. A total 135 skiers, 52 female and 83 male. Finishing times for local and SVSEF racers in minutes and seconds. Age classes are Masters ages 30-and-older, Senior ages 20-29, OJ 18-19, J1 ages 16-17, J2 ages 14-15, J3 ages 12-13, J4 ages 10-11, J5 ages 8-9 and J6 ages 6-7.